Glaro is proud to introduce the Elite Rail Crowd Control Post System – the next generation of crowd control and pedestrian guidance. The Elite Rail Crowd Control Post System is a cost effective alternative to expensive welded railings that require an extensive installation process. This handsome, stable, and crowd control system creates a permanent appearance and therefore makes an effective security barrier. It helps to organize people. The Elite Rail Crowd Control Post System can be assembled without tools, and is easily reconfigured, transported, or stored. The Elite Rail Crowd Control Post System rails are carefully engineered to create a precise rail-to-post connection. Every post is ready for 4-way directional use. Rails can be conveniently removed from posts and rearranged with little effort. 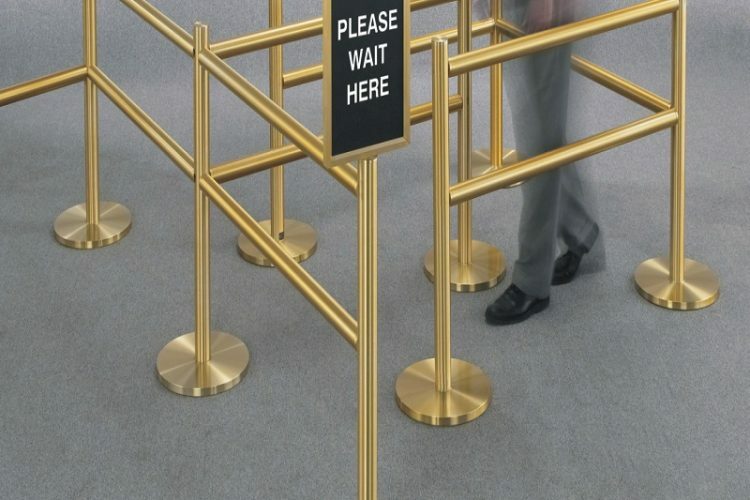 The satin polished aluminum rust and tarnish proof components of the Elite Rail Crowd Control Post System are available in 29 attractive finishes to match any facility design. The Elite Rail Crowd Control post System is made in the USA with recycled aluminum, steel, and packaging materials and is 100% post consumer recyclable.